Wow! 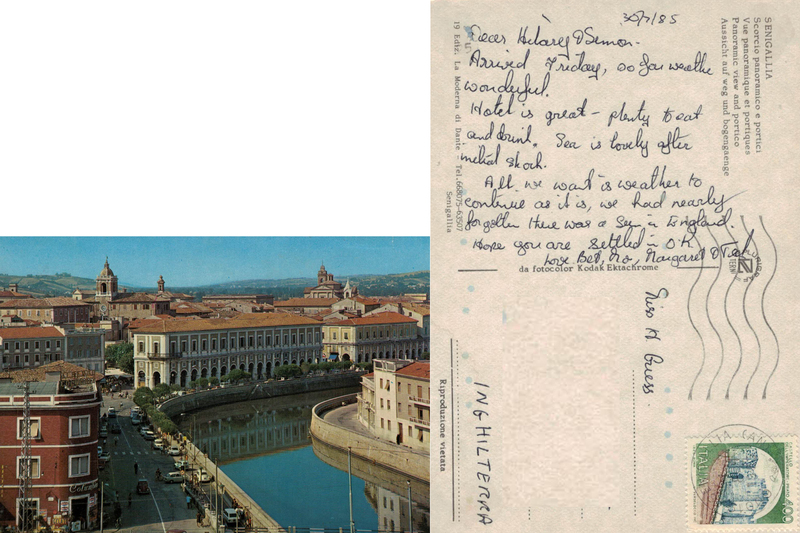 Tons of info crammed onto this card, which sadly lacks a date and a Spanish postmark. 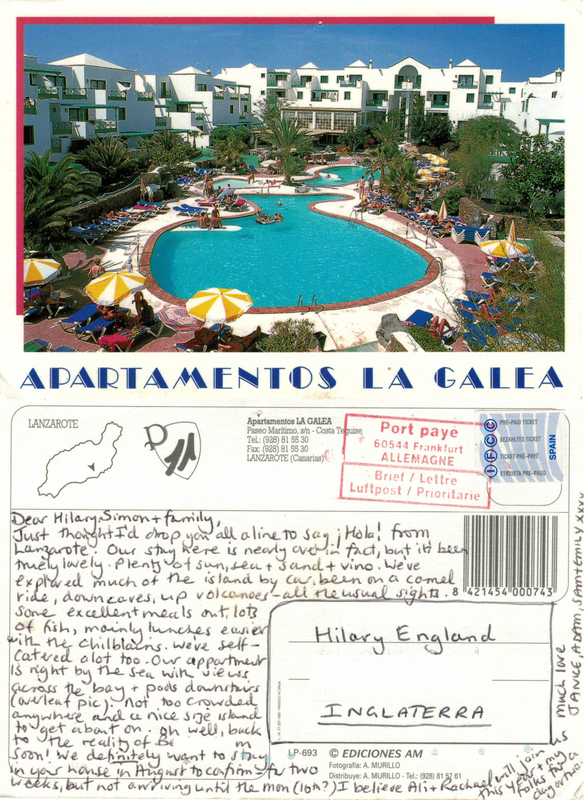 However, the sights and appeal of Lanzarote are elequontly described by Janice, who has obviously enjoyed the trip. The card has been post mark stamped in Frankfurt, presumably while en route to the UK. 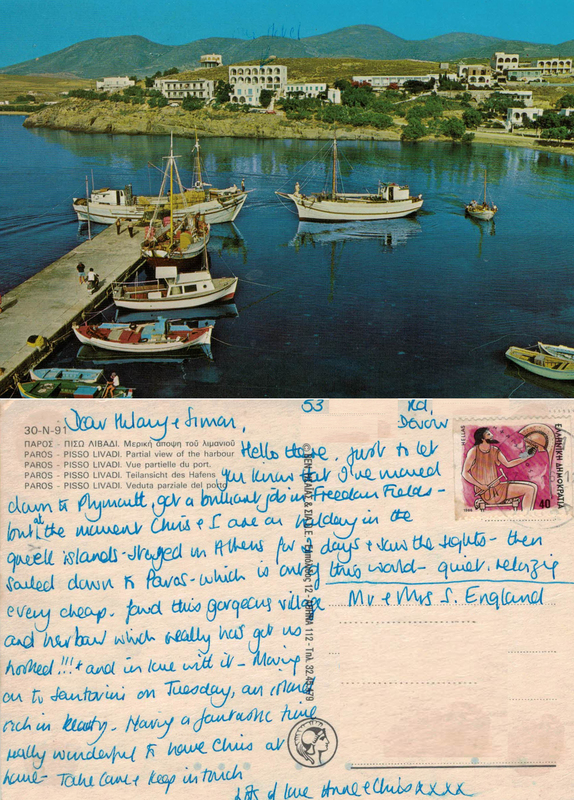 The stamp is an IFCC prepaid for a postcard. This is an unusual card as I do not recall ever meeting Janice and family; we have never been friends! Janice mentions Ali + Rachael in the text – I am friends with Ali and have known her about 25 years; we were expecting babies around the same time. I stayed in touch with Ali after moving to live closer to the sea. Despite being near the beach in the UK we would often go to France for two weeks in August, thus it made sense for Ali + Rachael to use our house for a holiday; Ali’s great friend Janice would also stay at ours with her family 🙂 I still see Ali regularly and she keeps me up to date with news of Janice and family! It seems that Italy is a popular holiday destination! This card is from Senigallia on the east/Adriatic coast where the sea is apparently cooler. Bet, Mo, Margaret and Ted are enjoying the sunshine, which has obviously been missing during the English summer. 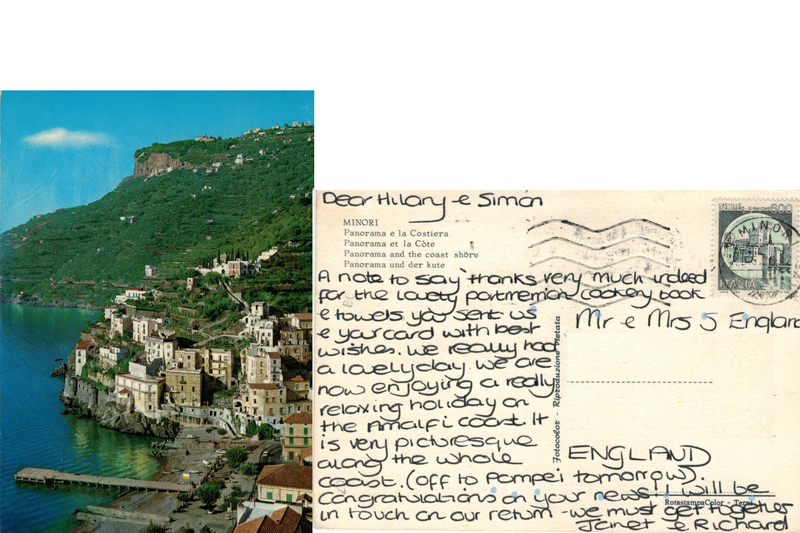 The card is postmarked ‘SENIGALLIA’ and carries a 400 lira stamp depicting Castello dell Imparatore-Prato from the 1980 definitive series of castles and strongholds. The arches of the historical building beside the River Misa, featured in the image on the front of the card, are a stark contrast to the popular and crowded seafront beaches. This was sent just after Simon and I moved into our first flat together, hence the ‘settled in’ reference. We were not married at the time; a cause for great consternation amongst some family members, but this card from Bet, Mo, Margaret and Ted suggests acceptance and support on their part. Bet & Ted are siblings and are first cousins to my mum. Bet was married to Mo (sadly Mo has died), and Ted is married to Margaret (they are both now in their nineties). Mum continues to have a close relationship with her cousins, seeing them regularly. I see them less, but exchange seasonal cards and swap news via Mum.